Tiramisù is probably the most famous Italian dessert, everybody loves it. During my time in the UK I have realised that offering to bring tiramisù to a dinner, a barbecue or even in the office for some special occasion, can induce a state of emotion and excitement in your audience. The sentence “I could bring a tiramisù” will open any door, so I have recently bought a tupperware big enough to contain 2 kg of tiramisù (in the background in the picture below). There is always someone interested in having the recipe, and even though publishing it will probably weaken my power over people, I have decided that the time has come to share it (obviously you could have just read it from the Silver Spoon book). But, before the recipe, a bit of history. Tiramisù is originally from Treviso, in Veneto, and the name is a composite of two Italian words “tirami”, “sù” literally “pull me” “up” or “lift me” “up”. This is because tiramisù contains eggs, mascarpone, sugar and coffee and is sure to give you a big boost to keep you going – other than lots of calories. 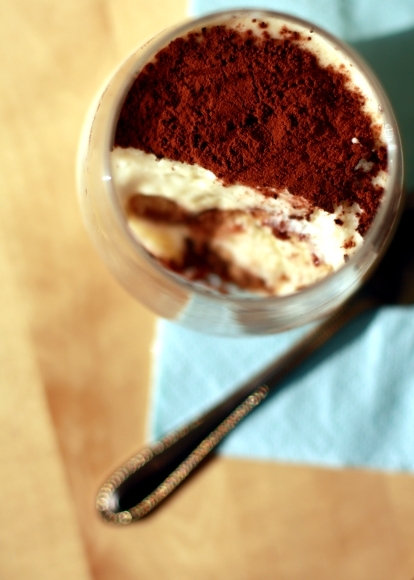 Despite its popularity, tiramisù is a recent recipe. 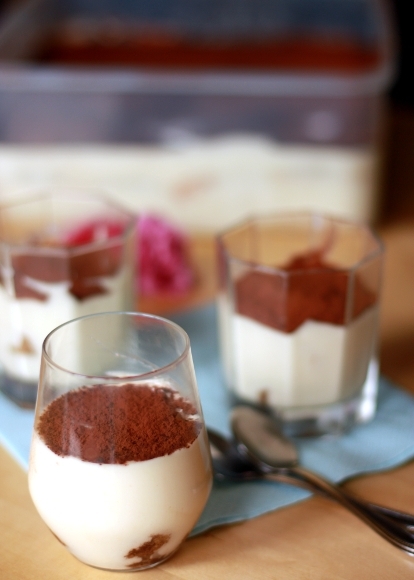 There are no mentions of tiramisù in cookbooks before the sixties. There are various versions of the recipe, with fruit, without coffee, with cream added to the mascarpone cream, etc. This is the one I use, which has the addition of grated chocolate on each layer and a small glass of Marsala, a sweet Italian wine from Sicily. Sometimes, when I feel in the need of sweetness, I like to add a bit of cream, but Michele prefers it without it. Prepare the coffee. In one bowl whip the egg whites and in a separate bowl grate the dark chocolate and set aside. Put the egg yolks in a large bowl and add the sugar, whisk until the eggs and the sugar have completely combined and have the consistency of a thick cream. The sugar should be completely dissolved. Add the mascarpone in two or three steps and whisk until you have a thickly whipped cream. With a wooden spoon add the whipped egg whites – you have to be very gentle. The mascarpone cream is done! Spread a bit of mascarpone cream at the bottom of your serving dish. Put the coffee into a shallow dish and dip in one savoiardo at a time for few seconds until they are nicely soaked, but not soggy. Layer these into your dish one next to the other, covering the whole area. Spread over one layer of mascarpone cream to cover the savoiardi and then sprinkle with the grated dark chocolate. If you have enough mascarpone cream repeat the layers but make sure to finish with a layer of mascarpone cream. At the end dust the top with cocoa power. Cover and leave it to rest in the fridge for a few hours or overnight. Enjoy! Note: The perfect savoiardi should be 2 cm thick and they are not easy to find here in the UK. The only big shop that has them is Waitrose. So much time has gone since my last post, but here we are with a new summery recipe. The biggest news is that we have an allotment (un orto) where we are growing all sorts of greeneries despite the slugs. Lettuce is doing great and so are the broadbeans, so I will try to post some healthy salads recipes in the future. Anyway, this year, a bit like last year, spring has struggled to arrive here in Oxford and temperatures are still quite low, especially for being summer. Strawberries, raspberries and all fruits and vegetables are late and the general feeling is not very summery yet. On the other hand, this week elderflower have finally blossomed. We discovered elderflowers here in the UK, and we love them. We like to have a walk along the Thames and forage these white umbrellas to use in different recipes. Here is the first one, but I think I will post another one soon. These light fritters must be served whilst they are hot and crisp and are absolutely delicious. We have simply sprinkled some sugar on them but you could also add a light dust of cinnamon. The inspiration for the recipe comes from Nigel Slater’s book “Tender Volume II”. In a bowl sift the flour then add the olive oil. Then slowly add the water while continuing to mix until you have obtained a homogeneous and thick mixture. Leave to rest for about 30 minutes. The resting time is essential to obtain a light batter which will not overwhelm the delicate flavour of the flowers. Just before you plan to fry the elderflowers, beat the egg white and add it gently into the batter. Shake the flowers to get rid of any insects and wash them by carefully and briefly dipping them in a bowl of water. Shake them dry and check that there are not small insects hiding amongst the flowers. Snip the flower heads into small stems. Heat the oil and test it to make sure it is hot enough – if you dip a small piece of bread this should get golden in a few seconds. 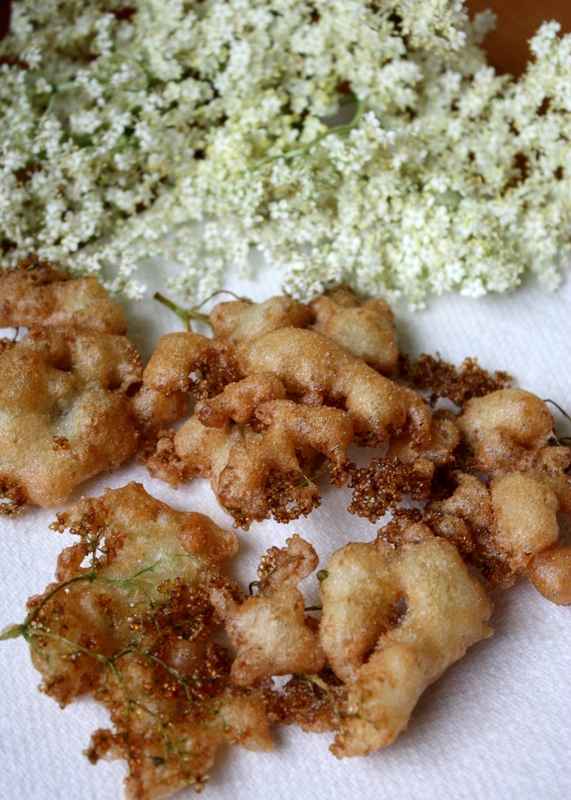 One by one, dip each elderflower into the batter and lower them into the hot oil. The batter will bubble up around the tiny flowers. Remove when the batter is gold and crisp. Place the flower on a plate with some kitchen paper to absorb the oil and sprinkle with sugar while still hot. Serve and eat when still hot and crisp. We are back in England. We spent the Christmas holiday in Italy with our families, as tradition dictates, but with a twist. In fact, this year we decided to travel to Italy by car which turned out to be quite funny when you drive a pink car with right-hand drive! 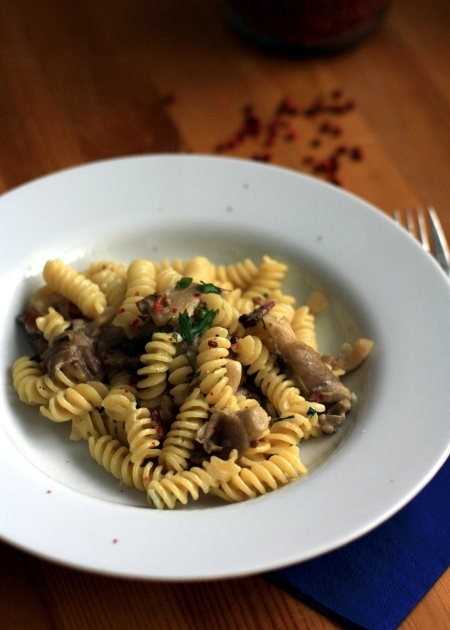 Today recipe is a warm and wintry pasta, perfect for the recent snowy days. For this dish we used fusilli, but you can also use a long pasta such as spaghetti o tagliatelle. The main ingredient is mushrooms, the best is to use porcini (ceps) but if you cannot get hold of them any other type of mushrooms is fine. We used some oyster mushrooms, which are probably the best farmed mushrooms you can buy. The other ingredient is speck, which we always bring back from Italy where it is widely used, even though it is typical of Austria. In a large pot bring to the boil enough water for cooking the pasta. Heat two tablespoons of extra-virgin olive oil in a pan and then add the garlic slightly crushed with the flat of the knife. When the garlic starts to turn gold add the sliced shallot and the speck cut in small stripes, and cook until tender at medium heat. In the mean time wash the mushrooms and cut them in large slices. Add them to the pan, cover with the lid and cook them until tender. At the same time cook the pasta. Add a handful of coarse sea salt followed by the pasta and cook for the required time (usually ~12 minutes for fusilli). Just before draining the pasta add the soured cream and the chopped parsley to the sauce, then add the fusilli to the pan and carefully mix with the sauce while the hob is still on low heat. Serve with some ground back pepper and a few pink peppercorns.